More dates coming soon. Total 6 anglers per trip. Price excludes gratuity. That’s Right is back up in Ocean City and I started out this weekend with good fishing. The shark fishing has been outstanding with lots of Makos and Blues and a handful of Threshers. The Offshore fishing has also been good as some warmer water has pushed into the 100 Fathom line in between the Normans and Washington. And there have been Yellowfins scattered up and down the line. 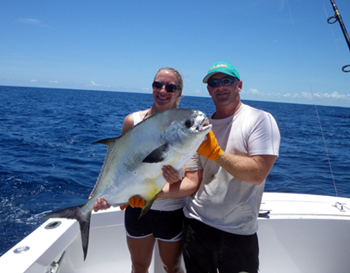 Most of us were catching anywhere from 4 to 15 fish ranging from 30 to 50 pounds…a nice class of fish. The water was clean green and 68 degrees. Most bites were coming on the plastic stuff, spreader bars and chains and a few bites on the Hoo’s. Just a touch outside in 500 fathoms the guys were finding even warmer water. There was quite a bit of debris and most of it was holding nice gaffer Dolphins. The Billfishing was even productive with both Blue Marlin and White’s running around. So, overall it has been an outstanding first week of fishing and the outlook is looking good! Tarpon fishing in Key West and the Lower Keys is at its peak, with anglers reporting double digit hookups on conventional gear as well as fly rod. 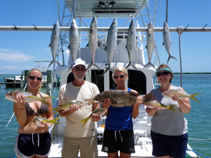 In Key West Harbor, our best fishing has been from our center console using shrimpboat trash or by catch. From the skiff, we've been having great action live baiting and fly fishing. The best catches have been coming early and late, and it’s a great time of year to do a split day, where you fish from 5 am to 9 am, then hit the water again in the afternoon starting at around 6 pm until 10 in the evening. Another exciting opportunity are our Marquesas mothership excursions. We just got back from one last week, in which 6 anglers on three skiffs jumped 30 tarpon to 120 pounds. Fishing from the mothership Playmate, we're able to be on the best water at daybreak, just about the time most other skiff guides are putting their boats in the water. We still have a few openings for the evenings surrounding a probable palalo worm hatch from the 24th until the 30th. 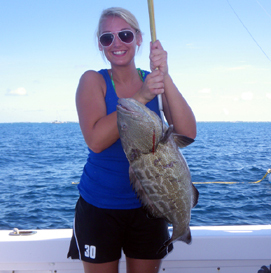 Contact us for more information on these one-of-a-kind multi-day flats fishing adventures. 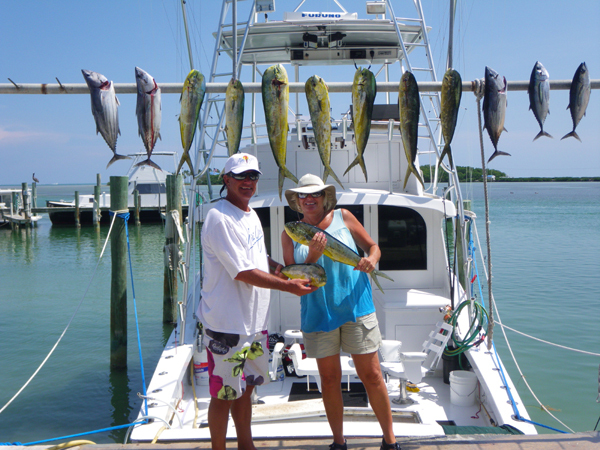 Offshore, we're continuing to see some good dolphin fishing and the reef action has been excellent for yellowtails, mutton snapper, black and red grouper. That should continue to get better as we move towards another spawn on the full moon. The Pretty Work has been steady going in the Florida Keys, which by the way is still wide open and Oil free!! Capt. Mark and Capt. 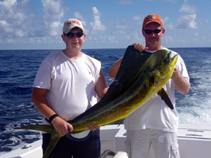 Andrew have been catching plenty of schoolie Dolphin with a few 15 to 20lb fish mixed in. 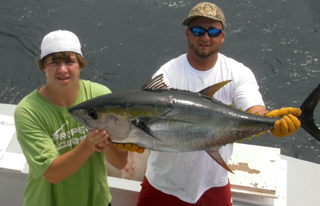 There have also been some Blackfin tunas on the Humps. Inside on the reef edge the Snapper fishing is crazy limits in an hour!! The Permit are still on the wrecks and eating the live crabs like gumdrops. Capt Clyde and Capt. Jeff have been doing well on the flats, bridges and backcountry. Capt Clyde has been slamming the Bonefish and Tarpon mostly on the fly and sight fishing. Capt. Clyde has released several 130lb plus Tarpon as of late and real good numbers on the Bonefish and Permit. Capt. Jeff has done well on the Bridges for the night time Tarpon bite and tells me the Backcountry is full of life with super catches of all types of fish. The outlook for the next couple weeks in the Keys is good. 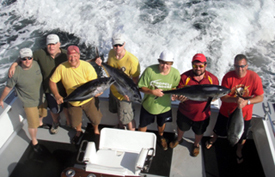 The Dolphin fishing should stay great with the bigger fish due to show up anytime. 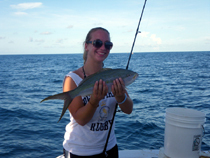 The Reef will come alive with great Mangrove and Hogfish fishing. Follow us for up-to-date audio reports and fish-tweets on what we're catching on a regular basis. Go to www.twitter.com/ fishoverunder and follow us today!!! Get interactive with OU and Become a Fan today! All of our reports in Real-time as they happen. Find it all here!